Part 2 of What's Your Resolution? This is the time of year when people are trying to keep New Year’s resolutions. Two of the most common Christian resolutions are to read the Bible daily and to pray daily. Did you know that January 17 has been named Ditch Your Resolutions Day? Why? Probably be-cause it only takes about two months into a new year to feel like ditching our resolution. 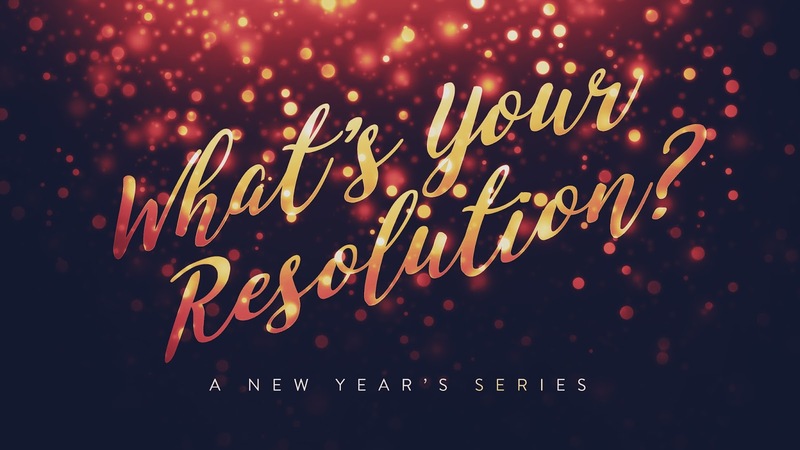 Resolutions are hard to keep: 50% of people make New Year’s resolutions, but 88% of those resolutions ultimately fail. How can we keep our resolution to pray daily? When you call to make an appointment with your doctor, you don’t speak to your doctor. You speak to your doctor’s receptionist. And you almost never get to see your doctor immediately. You have to make an appointment to see your doctor on a future day. Then when that day finally arrives and you go to your doctor’s office, you have to sit in a waiting room and wait. It’s very different when we want to meet with God. “Let us then with confidence draw near to the throne of grace, that we may receive mercy and find grace to help in time of need” (Heb. 4:16). “The eyes of the Lord are on the righteous, and his ears are attentive to their cry” (Ps. 34:15). We have direct access to God! Second, when we pray, we should remember that we’re approaching a Father who loves us. Throughout 1 John, John emphasizes that believers are God’s children (“born of God”). In 3:1, he writes, “See what kind of love the Father has given to us, that we should be called children of God.” God is a Father who loves his children more than we can imagine. Because we know God loves us, we can have “confidence” (v. 14) when we pray. Third, when we pray, we should remember that prayer really does work. But prayer is not a waste of time. It’s possible that when we pray we can “have the requests that we have asked of him” (v. 15). Of course, this doesn’t mean that we can make God do things he doesn’t want to do. Fourth, when we pray, we should remember that prayer isn’t all about us. Prayer is about getting God’s will done, not ours (“if we ask anything according to his will,” v. 14). We should also pray for the needs of others, not just our own needs (see v. 16). Fifth, before we pray, we should have a plan. Instead of saying to ourselves, “I want to pray daily,” we should make a specific plan. An ideal plan would be to combine Bible reading and prayer. Here’s one possible plan: (1) set aside 20 minutes; (2) pick a quiet time and place; (3) read a portion of Scripture; (4) meditate upon the words you have read; (5) ask God to speak to you through those words; (6) pray. I’m sure most of us have a few appointments on our calendars for this month: an appointment to see your doctor, an appointment to get your car repaired, an appointment to have coffee with a friend. We do our best not to miss our appointments. If you struggle with taking time to pray, my purpose is not to make you feel guilty about your lack of prayer. My purpose is to encourage you—starting today—to make sure you keep your daily appointment with God. Martin Luther, A Simple Way to Pray.